Caffeine is something that makes me happy. I don’t drink coffee so my caffeine fix comes in the form of a can of Coke at 10.30am each morning and some chocolate to beat the mid-afternoon slump. When Google announced changes to their search index last week and called it Caffeine, I naturally took notice. Of course, I have a vested interest in changes to SEO because it fundamentally affects the way I do work, but the word Caffeine resonated with me. It made me think of a high energy change. As David Bowie once sung, it’s time to face the strange. Google Caffeine is a change and it’s all about indexing web content faster. There will be more focus on updated and new content. The crawl rate of sites is still the same, but the time from crawling to indexing will be improved. Stagnant websites and blogs will do less well than ones that are updated frequently. Think about how you can refresh your current content and possibly tie it in with recent events and media. The importance of having a high quality blog attached to your website has now increased immeasurably. In terms of actual on-page and off-page SEO techniques, there is not much more you can be doing currently. Caffeine has not made any changes to the ranking algorithm. Keep using your analytics programs to track your keywords and rankings. As more information becomes available, it might be found it impacts core SEO practices. Google is very good at being tight-lipped about the mechanics of their search engine. I challenge anyone to explain how the Google algorithm works when many of the 200 odd ranking factors are kept secret. It really is a guessing game. Google does a nice job of explaining it to the general web user the 101’s using non-technical terms in the video below. As far as Google explaining its formula – I’m yet to find a user-friendly video on that, I’d even be happy with an unfriendly one! 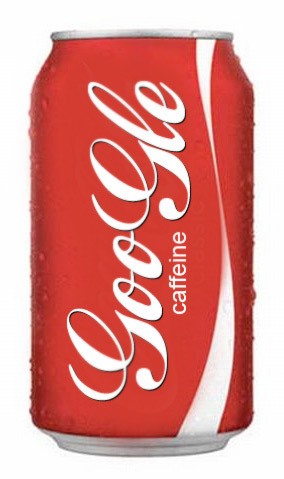 The Google Caffeine Coke Can image was a 5 minute Photoshop job using this image of a coke can. A free Coca Cola based font was added for the text, with the slight staggering seen in the Coca-Cola logo. I’d noticed that everyone so far has created Caffeine images using Coffee cups, so thought I’d go a different route.